In addition to its vintage 'Dinosaurland', Blackgang Chine has one other major Mesozoic-themed attraction. Much like the giant, brightly-coloured fibreglass mushrooms (occasionally with faces) that dot the hillside in various areas of the park, it is quite delightfully unhinged. Step right this way! The Triassic Club was first 'discovered' in 1994, following a major landslide that necessitated the relocation of several major attractions (including a replica cowboy town). As is usual at Blackgang, the premise is explained by way of a pleasingly silly rhyme. Lots of people have drawn dinosaurs in rather gentlemanly outfits, presumably because it's a vision that never ceases to be hilarious. Blackgang went one better, and stocked the Triassic Club with full-size robot beasts decked out in formal finery. Guests are greeted by Wallace, the butler, who complains witheringly about the master's demanding nature. He also requests that you kindly weigh yourself on a set of scales that denote which course of the feast you are most suited to becoming. Once weighed, it's time to move on to the next room where the master awaits! He introduces himself as Darwin the Allosaurus - "whom some have the cheek to call the 'other lizard'" - and intones in a louche, aristocratic manner that his guests "sssmell sssscrumptioussss". Requesting that the starter come forward, he nevertheless rejects the notion of eating any vegetarians, explaining that they tend to stick in his teeth. I've always enjoyed this attraction. Except when I was a small child, when the idea of a leering, toothy dinosaur speaking in a haughty aristocratic accent scared the hell out of me. Granted, the animatronics are hardly Disney-calibre, but then it wasn't made on that kind of budget (and it's getting old). One final thing worth mentioning - before a refurb a couple of years back Darwin had a different soundtrack that was actually far creepier. Happily, someone's uploaded it for posterity! Enjoy! Blackgang Chine is a tourist attraction on the southernmost tip of the Isle of Wight, an island off the south coast of England. It originally opened in 1843 around a scenic gorge leading down to the sea - such gorges are known as 'chines' on the island - and has been owned by the same family, the Dabells, ever since. For decades, it operated as a purely scenic attraction with some pretty landscaping, a fin whale skeleton and some gnomes, but a visit to the newly-built Disneyland inspired the owners to create a series of themed tableaux set on the hillside, mostly consisting of fibreglass models. The dinosaurs were added in 1972, and the vast majority (if not all) survive to this day, in spite of the fact that most of the park is in perpetual danger of falling into the sea at a moment's notice, and in spite of the fact that during the famous (er, in Britain) storm of October 1987 a lot of them did end up in the sea. Looming bizarrely out of the trees on a cliff edge, they are grotesque and often very hilarious. Of course, they also have a nostalgic appeal for many people, including me (my first visit was in 1992). The models often shown an interpretation of the animals' anatomy that's a little, uh, creative. In case you haven't guessed, the big blue guy is meant to be Brachiosaurus at about 1/2 scale. Its hosepipe neck and rather shapeless, lizardy body are certainly strange, but it's got nothing on some of the other models. 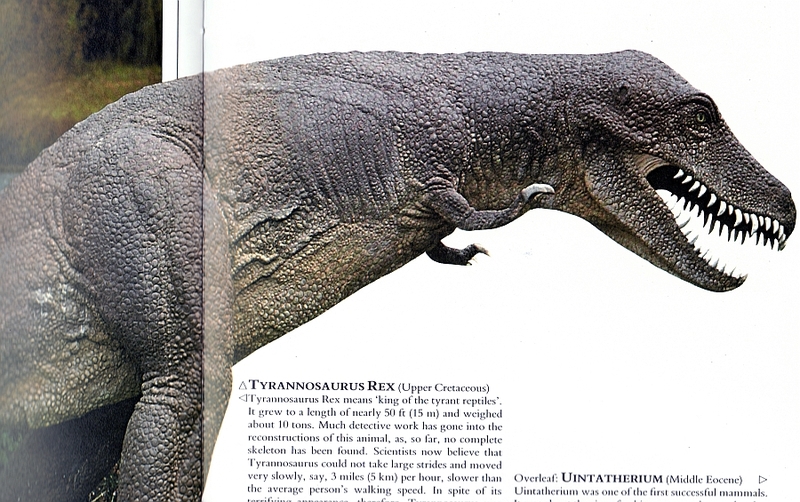 This might just be the derpiest Tyrannosaurus model ever. Certainly, it's a very strong contender. It's the man-in-a-suit tyrannosaurs of pre-1980s art writ large, and it's absolutely bloody hilarious - I love the way the neck merges into the torso with no shoulders to speak of, the weird squatting posture and the HUGE eyes. My cousin included for scale. PTERANODUCK! Actually, Blackgang were just championing the totally sensible hypothesis that Pteranodon used their beaks for dabbling, the apparently narrow beak of the skull actually supporting a very wide, keratinous sheath in life. 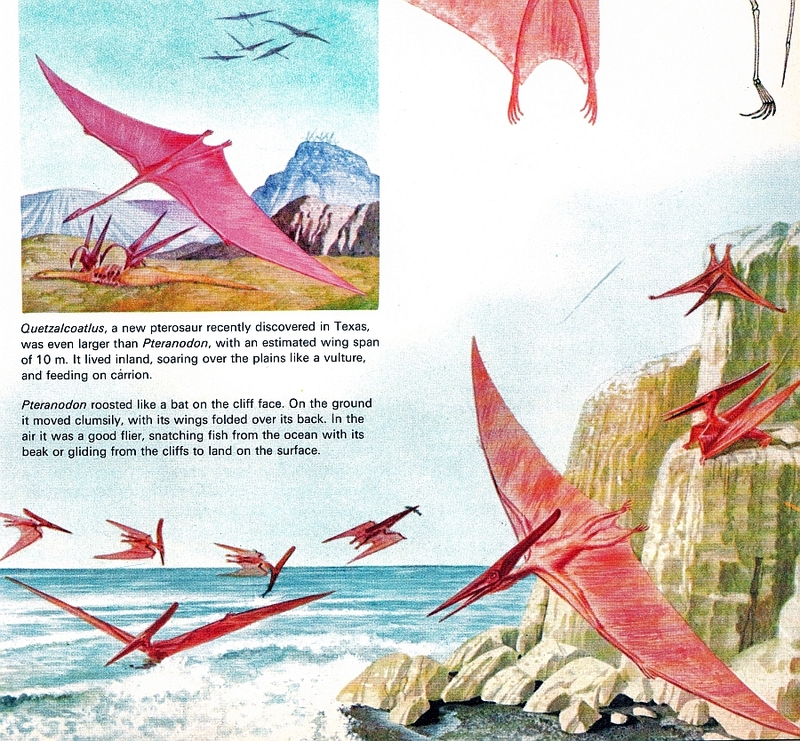 It's just one of the many pterosaur heresies that those elitist, super-wealthy palaeontologists don't want you to hear. Here we have Protoceratops, defending its nest from...something.One would expect Oviraptor, given the now-discarded idea that an Oviraptor with a crushed skull found on a nest was killed by an angry Protoceratops parent (it turned out that Oviraptor itself was the parent). However, it looks more like an ornithomimosaur, while a nearby sign identifies it as...Ornitholestes! Well, they all begin with 'O'...it's easy to confuse those damn complicated dinosaur names. Here we have a giant Dimetrodon, and it clearly isn't happy about something. Bless its grumpy red-lined chops. ...Our old friend, the gigantor elasmothere-styracosaur thing! I love the near-psychedelic paint job and demonic, solid red eyes. When the model's this silly already, why not? And finally...unlike most parks, Blackgang allow many of their dinosaurs to be climbed upon, which proves absolutely irresistible to children. Here we have a demonstration, utilising a rather odd-looking sprawling Polacanthus. Come back tomorrow for an aristocratic singing allosaur! A slightly unusual entry this week - in fact, it's a book completely devoid of illustrations. Instead, it's packed full of photographs by Jean Philippe-Varin that veer wildly from the artistically impressive to the downright hilarious - usually dependent upon the subject. The best ones feature life-sized models that, while almost always scientifically obsolete, are nevertheless quite awe-inspiring through their sheer size and the craftmanship involved (most of them aren't your usual goofy 1980s fibreglass monstrosities). The worst photos feature toys. We'll get to those in due course. 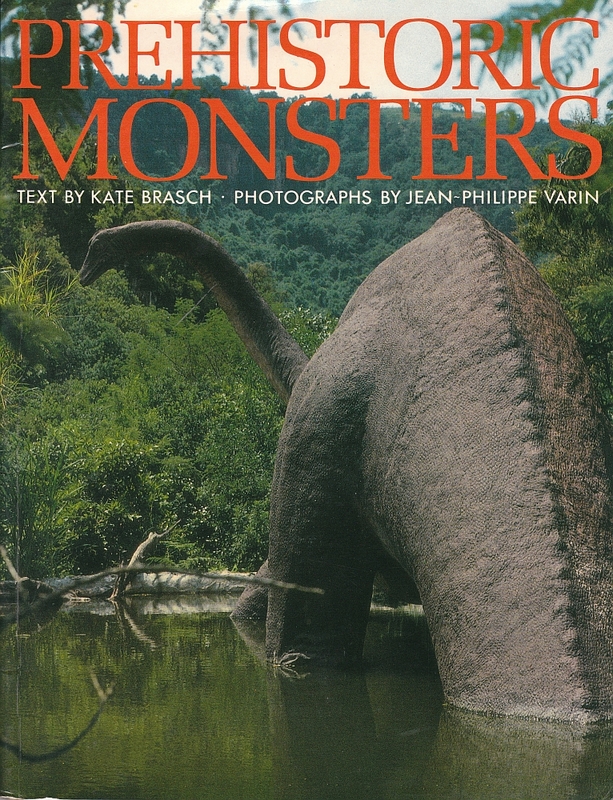 The Diplodocus on the cover is certainly very retro, but it's an impressive photograph nonetheless - the detailing in the sculpt is admirable, and the lush scenery is suitably evocative (actually, it reminds me of the Hawaiian locations used in Jurassic Park, although this book - from 1987 - predates the film by some years). There are a number of other models in this book in a similar style although, unfortunately, we are not given any indication as to where the photos were taken (so if any of you out there in interweb-land can tell me, I'd be exceedingly grateful). In a similar vein (and colour), here's a Parasaurolophus. Again, it's a pretty nice model for its age, and the photograph is moodily lit. The head is particularly well sculpted, with lifelike eyes and a very fine scaly texture - a commendable piece of work all round. Of course, there's always one animal that seems to come out badly in these situations. Ah, Tyrannosaurus - for all its fame and recognition, it's suffered a few indignities over the decades, not least during the 1970s-80s when it was routinely described as a gigantic fanged joke that toddled along at a snail's pace. This book doesn't buck the trend, with author Kate Brasch describing the animal as having "slim" teeth "like blades" that were "probably too weak for attacking other reptiles" - in spite of the fact that (as if I need to tell you) tyrannosaurs actually had very thick teeth that weren't bladelike at all, in contrast with more 'conventional' giant theropod dinosaurs, like the allosaurs. Ludicrous. Anyway, the model's quite impressive from a purely technical/artistic point of view but is waaaayyy wide of the mark anatomically (what happened to its shoulders?). Speaking of which, it's time for an old friend! It's the elasmothere-styracosaur-thing! He's popped up before on LITC and no doubt will again...later this week, actually. It could well be one of the most prolific (larger than) life-size fibreglass dinosaurs ever, and I'd be very keen to learn of its origin, who sculpted it and why they stuck the horn on its bloody forehead. This isn't a bad photo - while it's far from a dramatic angle and doesn't show off the spikiness of the beast, the intention was probably to create the impression of an opportunistic shot of an animal in the wild. Speaking of prolific models, I've definitely seen this battling pair before.This is actually a crop of a photo that was taken at far too great a distance and consists mostly of grasses and bog. Crested mosasaurs always raise a smile - they smell sweetly of nostalgia, and possibly fish. And so, to the toys. 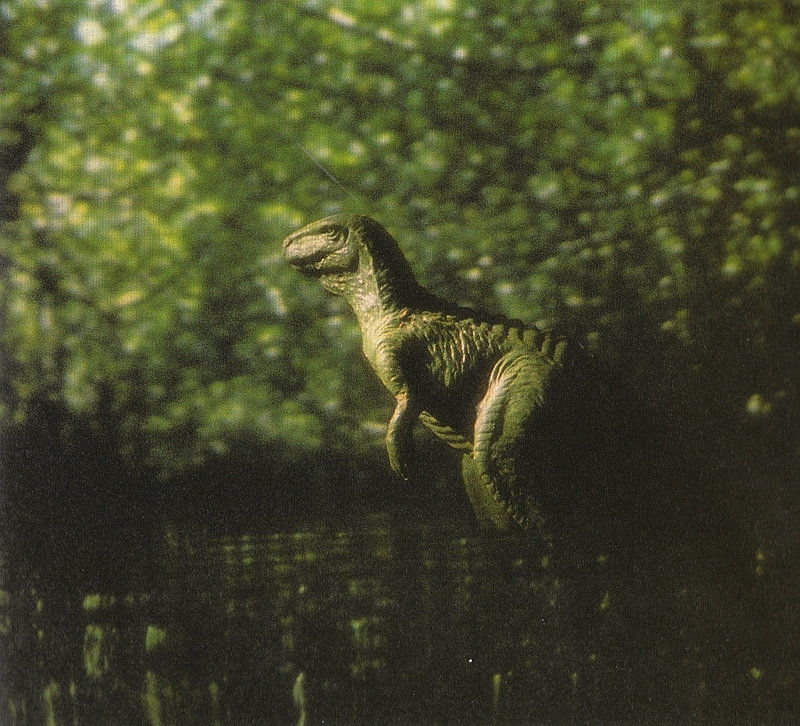 Here we see the 1970s Invicta Megalosaurus in its original monochrome green with a very green backdrop, presumably to hide the fact that nobody bothered to paint it for this professional, commercial photoshoot. This extinct beast is now found in the eBay formation, but its original habitat would have been the hot, crowded environment of the Natural History Museum gift shop. 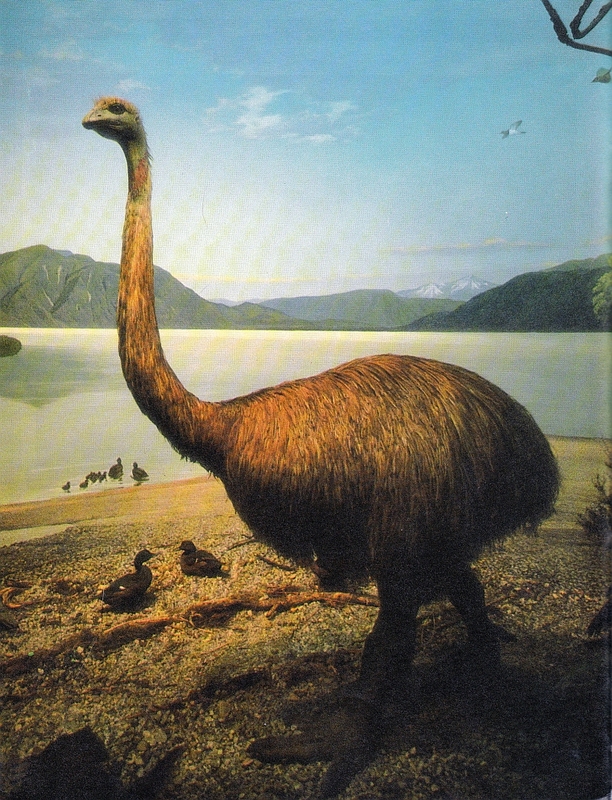 Still, I always like to go out on a high note, so here's by far my favourite image in the book - a photo of an awesome giant moa model, with an equally impressive backdrop. An amazing creature, a stunning model, and of course it's every bit the big old theropod dinosaur right down to its scaly, tridactyl feet. Lovely. P.S. Many thanks to Niroot for letting me borrow this book! There may well be more to come...hopefully when I've had a better day at work. I'm trying a slightly different format this time around, arranging links by theme rather than listing them like I have been. Not quite a return to the original format of these roundups, but a little more fun for me to put together. We'll see if I like it enough to stick with it. Anyway. On to the link-o-rama. Tarbosaurus bataar has been all over the news lately, what with the flap over the auctioning of a disputed specimen last weekend by Heritage Auctions, as well as a single leg that was to be scheduled by Christie's, but has been saved for now. The SVP has now issued a statement via its blog. I wrote two posts (one and two) on the auction, Brian Switek has covered it both at Dinosaur Tracking and Laelaps, the former of which has a rather spirited comment thread going. Dinosaur National Monument's paleontologist, Dan Chure, has been spreading the word via the Dinosaur Mailing List and his Land of the Dead blog. Victoria Arbour wrote a great piece at Pseudoplocephalus which goes into how museums work and why paleontologists aren't trying to greedily hoard fossils. It's also been covered over at the new blog Musings of a Clumsy Paleontologist in a pair of posts (one and two). At the team blog Skepticblog, Donald Prothero summed up the issue quite nicely. 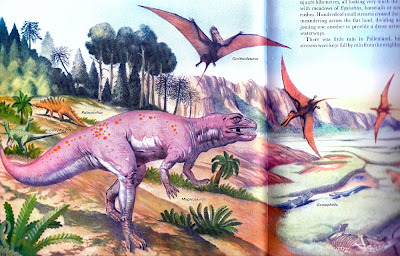 Also check out Illiterate Scholar's post at Dinosaur Couch and Andrea's at Theropoda. Pterosaur goodies: Photos of a rare Dimorphodon tail at the Pterosaur Database, and Pterosaur net delivered a post by Michael Habib on the trend of large body sizes in pterosaurs as well as details on a new paper from Elaine Hyder, Mark Witton, and Dave Martill analyzing the evolution of the pelvis across the pterosaurs, and ad Archosaur Musings Dave Hone wrote a bit about what we know about pterosaur ontogeny. Fun stuff: A diorama contest from Dinosaur Toy Blog and Dan's Dinosaurs, Doodle of Boredom mashed Edward Scissorhands, dinosaurs, and topiary together, Jenn Hall adapted dinosaurs to the "Three Wolf Moon" meme, an idea Trish Arnold also explored with our new buddy Yutyrannus recently. And Bissette's Tyrant is back! Returning to broader issues that affect paleontology and the public understanding of science, I think it's important to use this space to add my voice to the chorus calling for a new age of open scientific publishing. Mike Taylor of the SV-POW blog has been one of the loudest, clearest, and most persistent voices in this issue, offering post after impassioned post at SV-POW calling for the wall erected by many academic publishers between the public and scientific research to be torn down. Taylor has now written a piece for the Guardian which is well worth reading. I can't say it more clearly and wouldn't try. There is a White House petition which is well on its way to amassing its goal of 20,000 signers. It's painless. A few days ago, I was signer number 700 and change. It's already well past 10,000 signatures. Please, do it. Open access to research paid for by our tax dollars is crucially important. Plus, you don't need to be an American to sign. Sign the petition and take a few minutes to read about this issue. Just a quick note to let you know that I'll be mostly off-line for the next couple weeks. Jennie and I are getting on a plane and heading out west. Among other places. I'm too excited to sleep, but sleep I must. I have some posts scheduled, and Vintage Dinosaur Art will continue, but don't expect me to be immediately reachable in the case of a dinosaur emergency. Brian Switek recently shared his new Allosaurus ink, courtesy the masterful pen of Glendon Mellow. It rides a wave of attention being given to scientifically-themed tattoos courtesy Carl Zimmer's latest book, Science Ink, in which he shares his favorites among the many science tattoos that have been sent to him via his blog. Of course, paleontology is represented. It is the mightiest of sciences. Of course it is. As it happens, there is also a group at Flickr devoted to tattoos of a saurian nature, and they range from simple outlines to faithful illustrations of skeletal remains to more cartoony treatments of dinosaurs. First up, a very cool design worn by one of my contacts, Brian Rusnica. Not a dinosaur, but how could I not mention this Postosuchus? 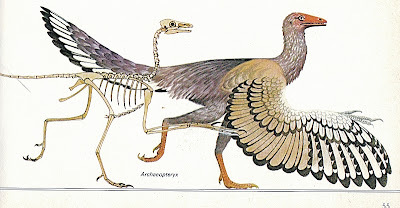 One of the few representatives of feathered dinosaurs is this Microraptor. On the cuddly side, this ceratopsid hatchling. Another ceratopsid, a Triceratops skull covered in flowers, as it should be. A fanciful take on a bonebed, it would seem. There are plenty that are simply bizarre, of course, and my favorite of these is this King Tyrannosaur. What's up with that pink ghost? I'm going to assume that this is a reference that I'm just not getting. True story: one of the first posts on this blog was about this very same subject. The Mongolian Government's request, issued less than 48 hours before the auction, is misleading, unreasonable and inappropriate. There is simply no reason to believe that any laws enforced by the United States have been violated and we remain unconvinced that even Mongolian law would have prevented export from Mongolia. It's important to note that Mongolia won its independence in 1921 and this specimen is obviously quite a bit older than that. By far, the most galling statement I've yet read is the bit that says "Mongolia won its independence in 1921 and this specimen is obviously quite a bit older than that." Quite a strategy, undermining the very idea of a nation laying claim to the natural resources within its borders, just because those resources were formed long before the nation existed. If that's the case, let's just throw out all of international law. I can't wait to see what proof Heritage can provide for the fossil's legality. It apparently comes from "an individual with a good reputation who has warrantied in writing to us that he holds clear title to the specimen. We've seen no evidence even suggesting that the fossils were collected illegally." Nope. That doesn't cut it either. You've seen it. You just refuse to acknowledge it. Shifting the burden of proof doesn't change it. The protestations coming from the auction house have a familiar flavor to them, seemingly ripped straight from the Creationist playbook. Creationists are protecting their dogma; Heritage is protecting its money. It all adds up to a deliberate effort to ignore the truth and manufacture doubt with irrelevant statements like “no one knows where exactly it was dug up. They’d have to find the hole and match up the matrix.” If it's a Tarbosaurus, it came from the Nemegt Formation. If it came from the Nemegt Formation, it was illegally exported. Simple. There's the bare sliver of a chance that it came from a Nemegt exposure previously untapped, from outside Mongolia, but in a message to the Dinosaur Mailing List, Dr. Tom Holtz writes "if that were the case for this specimen that would make it even more scientifically significant!" Facts about the materials' collection and those who did all the hard work of transporting, preparing, and mounting it, are hard to come by. Going by a report in the Daily Mail, Painter Law Firm writes that "this 80 million year old fossil was found in the Gobi Desert in Mongolia in 2005. A team of UK and American scientists assembled it. Mongolian law prohibits the transport of such fossils outside the country." 1. These fossils are part of the natural heritage of the Mongolian people. 2. These fossils deserve to be studied properly, so that the people of Mongolia and the world can benefit from the knowledge the material holds about the history of life on Earth. 3. Stealing is bad, but when conducted by a group of people who should know better, it's unforgivable. It's sad that this specimen was sold, but I'm going to remain hopeful that the Mongolian people will receive justice when this case is heard in court. The auction house can make all the noise they want. They'll run into the same problem the Creationists do. We've got the facts on our side. Brian Switek's post at Laelaps, with combative comment thread! One last thing, copyeditors: T. rex, not T-Rex. Okay? 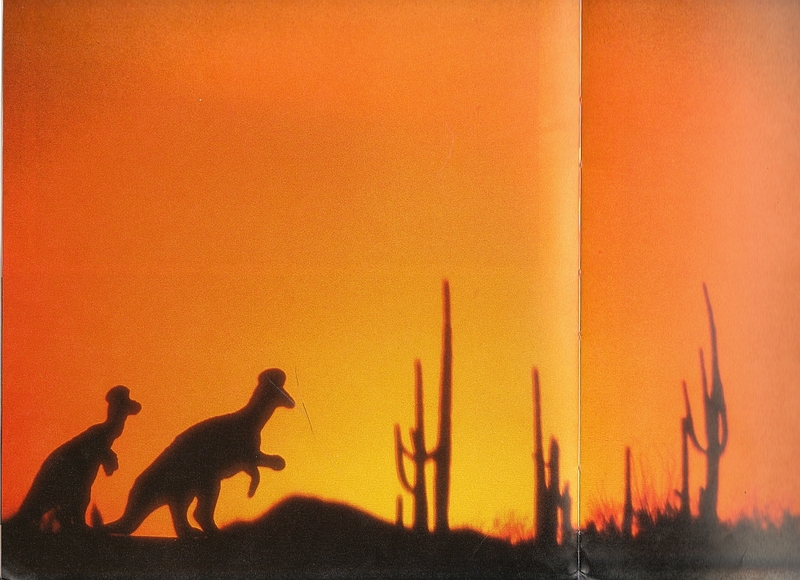 Here's a change of pace for these posts: an obscure slice of novelty pop released in the late eighties called "Dynosaur Dance." Reader, contributor to the VDA Flickr group, and official Friend of the Blog Terry Thielen recently picked it up, and we're richer for it. Released by Blast Records in 1987, it is credited to "Dino and the Dynosaurs," and appears to have been recorded by a line-up of session musicians led by a man with the suspect name "Dino Pizzarelli," (which nevertheless seems to be an actual name given to an actual person). Production is credited to two industry veterans, Glen Kolotkin and Benny Kay. I am sure that nothing on their combined resume matched the pleasure of recording this record; Louis Armstrong, the Ramones, Pete Seeger, the Lovin' Spoonful, Captain Beefheart or Bonnie Raitt couldn't possibly have offered the kind of artistic satisfaction "Dynosaur Dance" did. The credits and center label continue the ramshackle comic look of the album cover. 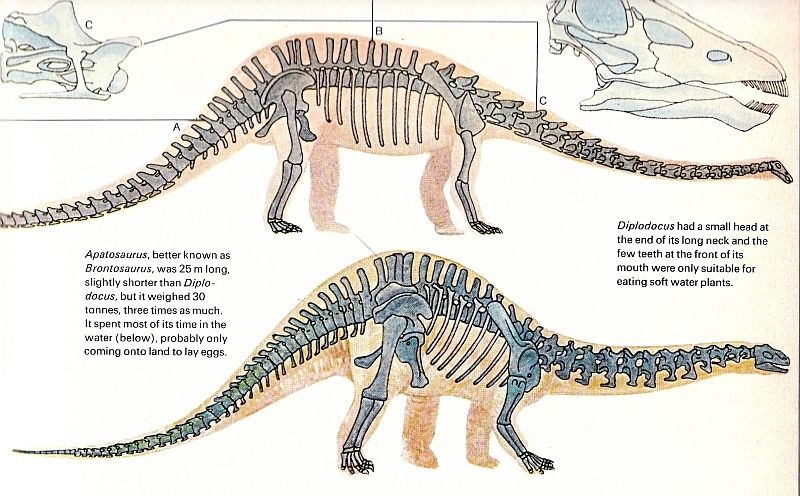 My favorite is definitely the doofy sauropod above. "Goot!" Enough about the album art, though. What you really want to know is how it sounds, right? It sounds like this. Sublime, isn't it? Just smacks of some family member of someone at the studio getting a huge favor. Thanks for sharing this, Terry! 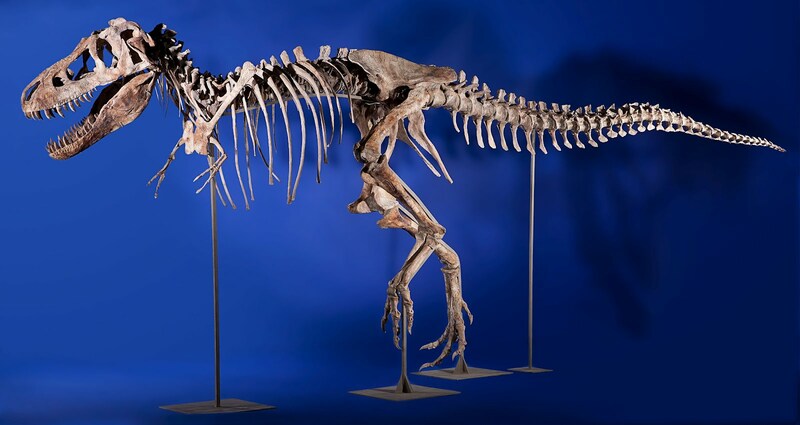 You may have seen links being passed around about the Tyrannosaurus bataar - AKA Tarbosaurus bataar - being auctioned off by Heritage Auctions in New York City this weekend. It may well be an illegally obtained specimen. As in, stolen from Mongolia. Mongolian president Elbegdorj Tsakhia has released a statement about his concerns. 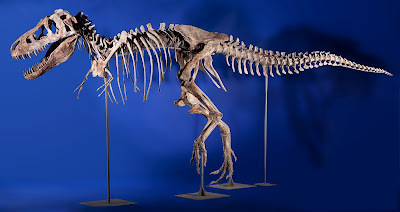 The tyrannosaur in question, from the auction house website. It is with great concern that I see Mongolian dinosaur materials listed in the upcoming (May 20) Heritage Auctions Natural History catalogue. For the last 22 years I have excavated specimens Mongolia in conjunction with the Mongolian Academy of Sciences. I have been an author on over 75 scientific papers describing these important specimens. Unfortunately, in my years in the desert I have witnessed ever increasing illegal looting of dinosaur sites, including some of my own excavations. These extremely important fossils are now appearing on the international market. In the current catalogue Lot 49317 (a skull of Saichania) and Lot 49315 (a mounted Tarbosaurus skeleton) clearly were excavated in Mongolia as this is the only locality in the world where these dinosaurs are known. The copy listed in the catalogue, while not mentioning Mongolia specifically (the locality is listed as Central Asia) repeatedly makes reference to the Gobi Desert and to the fact that other specimens of dinosaurs were collected in Mongolia. As someone who is intimately familiar with these faunas, these specimens were undoubtedly looted from Mongolia. There is no legal mechanism (nor has there been for over 50 years) to remove vertebrate fossil material from Mongolia. These specimens are the patrimony of the Mongolian people and should be in a museum in Mongolia. As a professional paleontologist, am appalled that these illegally collected specimens (with no associated documents regarding provenance) are being sold at auction. "There is no legal mechanism to remove vertebrate fossil material from Mongolia." Says it all, doesn't it? It's hard to believe that there could be a favorable outcome to this, but here's hoping that reason prevails and the auction house does the responsible thing. I am writing you at the request of Elbegdorj Tsakhia, the President of Mongolia. He has asked me to inquire on the country of origin for the specimen of Tyannosaurus (aslo known as Tarbosaurus) bataar (lot 49315) which is scheduled to be auctioned by your company this Sunday, May 20, 2012. I am the director of the Institute for the Study of Mongolian Dinosaurs and also serve as the New York representative of the Mongolian Academy of Sciences. Based on our experience in the studying the collecting of Mongolian dinosaurs, and on the information provided by your company with other specimens to be auctioned this Sunday, we strongly suspect that the Tyrannosaurus specimen, as well as several others you intend to auction, came from Mongolia. Mongolian law prohibits the export of fossil specimens, and if this specimen did in fact come from Mongolia, we we strongly urge you not to auction this specimen because it would then have been acquired and exported illegally. In fact, information on your website indicates that two of the tyrannosaur teeth (lots 49318, 49320) came from the Nemegt Formation, which is only exposed in Mongolia. Thus these specimens were acquired and exported illegally. We also strongly suspect that the ankylosaurus skull (lot 49317) came from Mongolia, and the troodontid may have come from Mongolia as well (lot 49318). The auctioning of such specimens fuels the illegal fossil trade and must be stopped. If you could provide detailed information on the provenance(s) of these specimens, I will then pass on this information to the President of Mongolia. I strongly urge you not to auction the two, illegally exported tyrannosaur teeth from Mongolia. I strongly urge you not to auction the other specimens we have indicated until their legality is fully resolved. Even if the owner indicates that they did not come from Mongolia, we suggest that you investigate this matter closely as sometimes collectors falsify information or documents to make illegal specimens appear "legal". In the meantime, the best approach would be an open dialogue with the government of Mongolia and other interested parties in order to find an acceptable resolution to this problem. If it is eventually determined that these specimens did not come from Mongolia, it would be prudent for Heritage Auctions to consult the laws of the country of origin because many countries now prohibit the export or sale of such specimens (China is one example). Thank you for your prompt attention in this matter. There's a petition at Change.org that needs some signatures. Can't hurt. 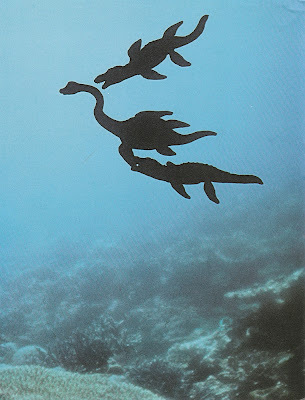 Darren Naish of Tetrapod Zoology fame wrote a rebuttal to the piece published in April in Laboratory News by Brian J. Ford which claimed that dinosaurs would have been obligated to a life in the water because of their size. Tough but fair. Along the same lines... Against his better judgment, Brian Switek watched the whole Ancient Aliens episode which featured a bunch of dickweeds spinning sub-L. Ron Hubbard sci-fi stories of aliens exterminating dinosaurs as fact. If I seem a bit prickly over this kind of BS, it's because I spent a fair number of years when I was younger buying the nonsense peddled by Richard Hoagland and Graham Hancock, and I can never have that time or mental energy back. Continuing coverage of his visit to the Field Museum of Natural History, Matt Wedel of SV-POW shared images of the Rapetosaurus skeleton on display there. The only titanosaur mounted in the US, which was a real surprise to me. Rapetosaurus at the FMNH, photo by me. Heinrich Mallison also visited a museum lately, the Natural History Museum in London. He found the lower level of the dinosaur hall to be... lacking, shall we say? His very entertaining rant at Dinosaurpalaeo. Dave Hone reviewed a terrific kid's book from NatGeo, When Dinosaurs Dawned, Mammals Munched, and Pterosaurs took Flight, illustrated by the great Hannah Bonner. 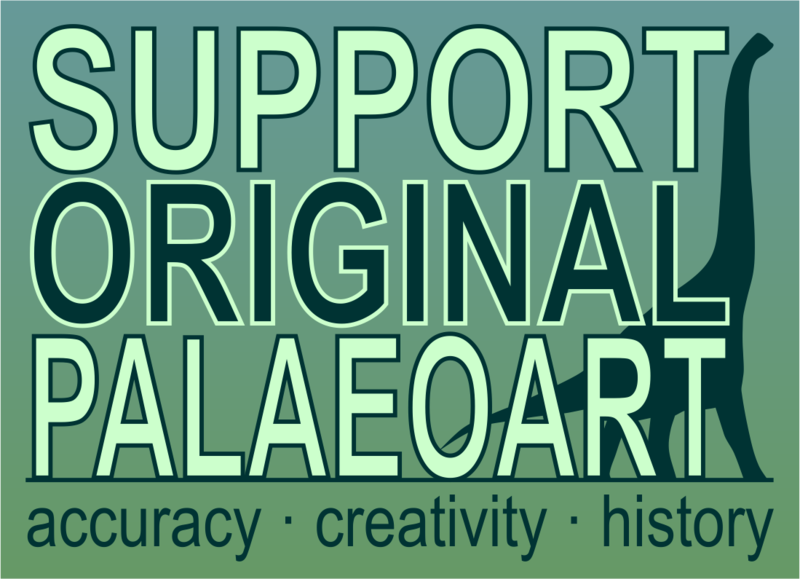 The newest gallery of paleoart has been posted at ART Evolved, and it's a special one, as it honors the recently departed Dan Varner, beloved for his gorgeous illustrations of Mesozoic Sea Life for Mike Everhart's Oceans of Kansas project. Be sure to stop by and check out some terrific work. Trish Arnold offers her own take on a title Marc wrote about last November Check out what Trish has to say about a book that "creates its fair share of mood whiplash." The Houston Museum of Natural Sciences blog features a post about "Wyrex," one of the tyrannosaurs starring in their new exhibit space opening this year. "It is a fun fantasy. Think of it: a young mated couple of rexes relaxing after a meal of duck-bill meat, stroking each other’s necks and muzzles, then petting their newly hatched chicks." At Aero Evo, Michael Habib briefly commented on the importance of pigments to feather strength, and why it's a good idea to study feathers at all. What role did forest fires play in the Late Cretaceous world of dinosaurs? Mark Wildman writes about recent research in this area at Saurian. The Dinosaur Toy Blog recently reviewed a stunning model of Torvosaurus by Shane Foulkes. No, the other kind of dinosaur gas. Photo by Jason Clor, via Flickr. 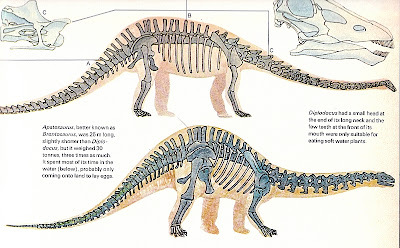 If you're reading this blog, you've surely heard about the correspondence published in Current Biology this month which proposed that the titanic sauropods could have produced methane in such large amounts that they could have been a significant factor in the warming of the climate. No surprise, it's been absolutely manhandled by the popular press, which has once again shown its ability to go far beyond the scope of a scientific paper to draw conclusions the authors never intended. Fox News was the worst offender, stating outright that "Dinosaurs 'gassed' themselves to extinction." I know a story is making a splash when I'm fielding questions from people I know, and my initial reaction was "eh, maybe?" I'm no expert, I've repeatedly stated, and some of the methods used by David Wilkinson, Euan Nesbit, and Graeme Ruxton were well beyond my current understanding. But it was clear to me that their work was presented as a proof of concept and a launching point for further work, not a definitive statement. It's full of assumptions which are built on assumptions, and would require a mountain of research to be demonstrated as plausible. Jon Tennant at Green Tea and Velociraptors is less diplomatic about it. "The less-than-two-page report, however, is pretty devoid of actual science, and is the kind of analysis that I’d expect from an undergraduate. A bad undergraduate." 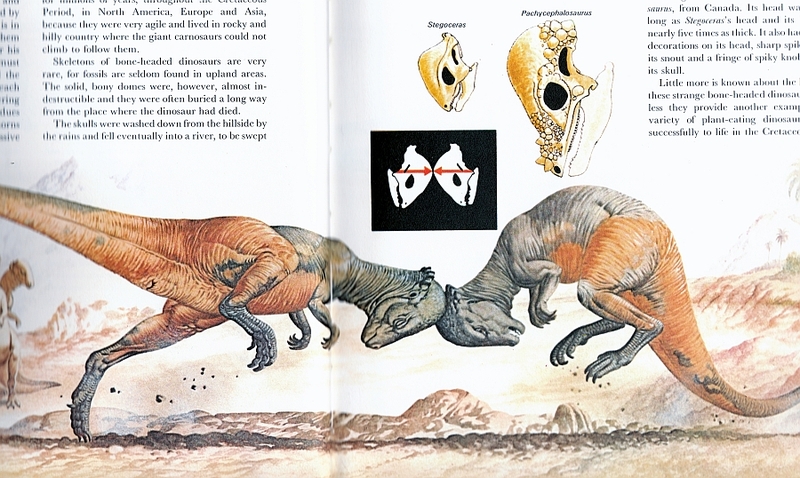 Brian Switek also wrote about the strengths and weaknesses of the work, as well as calling attention to the media's fumbling of it, at Dinosaur Tracking. My main reason for posting about this paper is that Dr. Thomas Holtz, one of the most visible American paleontologists, summed it up in the most succint, powerful way I've yet read in response to a question on Facebook. It's a great final word on a subject that may or may not receive follow up research in the future, and it's worth quoting here in its entirety. On the one...er... hand, they are probably correct that sauropods were major methane producers. But in the paper itself they don't deal with any other sources, sinks, or fluxes of greenhouse gases, so it is impossible to say whether these actually contributed to warming. Nailed it. 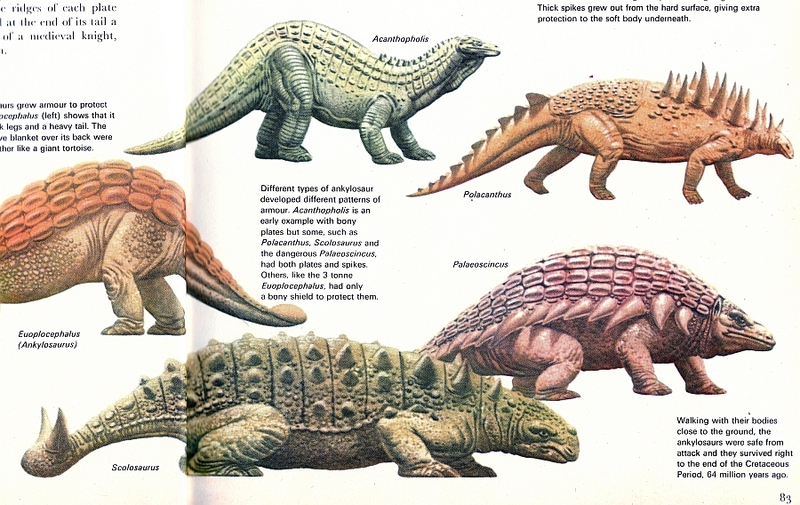 Wouldn't you know it, Dave Hone has an interview with Dr. Holtz up at Archosaur Musings today, so do head over to Dave's place and read it. 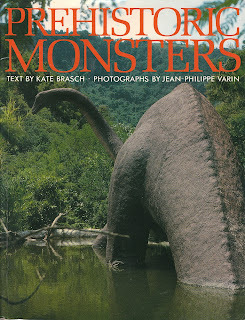 There's far too much 1970s goodness in The evolution and ecology of the Dinosaurs to be contained in a single post. May I now present yet more classic Caselli illustrations and occasional Bev Halstead strangeness. Hooray! Among other eccentricities, Halstead seems to have a real love for the classic, chimeric "Brontosaurus" a la Marsh. In other books, Halstead referred to apatosaurs as 'brontosaurs' even after acknowledging their correct name; here, he perpetuates the myth that Apatosaurus "used to be called Brontosaurus" (the name Apatosaurus came first - it's a generic name ferchrissake!). Accordingly, Caselli illustrates Apatosaurus semingly based on Marsh's 1880s "Brontosaurus" skeletal, complete with mismatched macronarian head. 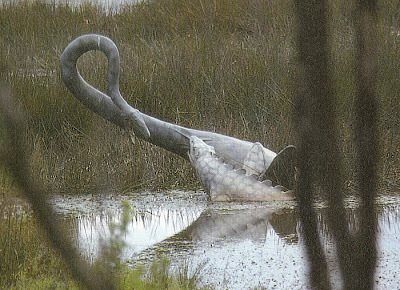 When it comes to sauropod habits, Halstead is most definitely of the old, swamp-dwelling school, and he points to various features of the sauropod skeleton that are (according to him) adaptations to an aquatic lifestyle, including a long, heavy tail that served as a sort of anchor/propulsion device. Of course, nobody in their right mind would suggest that these days. Still, I digress - this is supposed to be about vintage art, not giggling at how silly people were in the 1970s (and that they most certainly were). To illustrate Halstead's description of a trackway made by sauropods on a lakebed, Caselli provides a rather strange image of some 'brontosaurs' doing just that. Of course, being all dopey and small-brained, the poor dears have got their tails in a tangle. Looking at this lumpen mess of tails and blobby bodies and protruding limbs is a little...confusing. 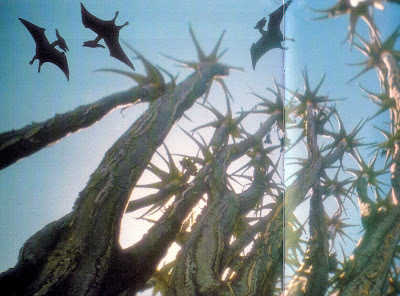 Unfortunately, it's a tiny image, but here we see what might well be the genesis of an art meme that saw Quetzalcoatlus depicted as an "evil, pin-headed, toothy nightmare monster that wants to eat your soul" (warning: hellish images of bloodthirsty demon-pterosaurs not for the faint hearted). 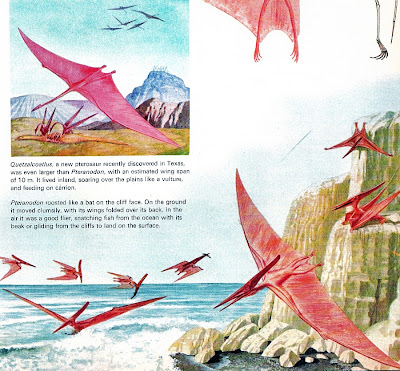 Caselli's Pteranodon aren't bad by comparison, although the individual hanging like a bat on the right hand side is unfortunate (and another art meme - one that's still not quite dead). 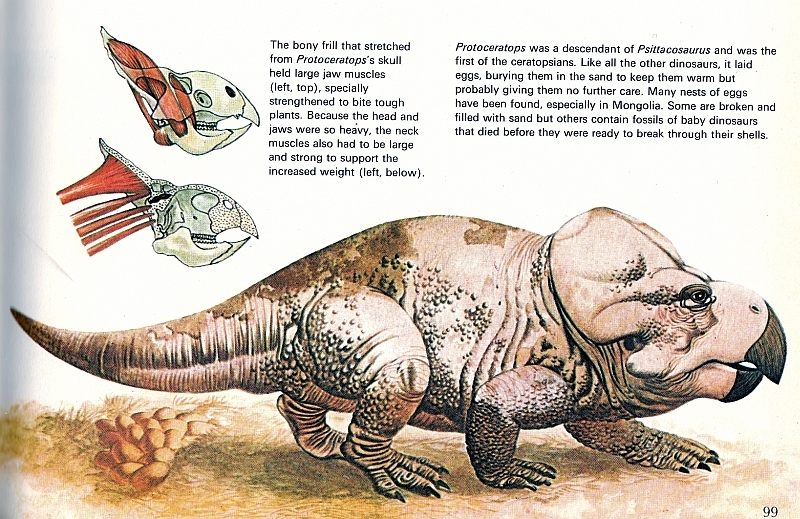 Halstead has some very peculiar ideas about ceratopsians and especially Protoceratops, which he claims weighed 1.5 tonnes, in spite of the fact that "it was only 75cm high at the hip". That's one seriously lardy animal. 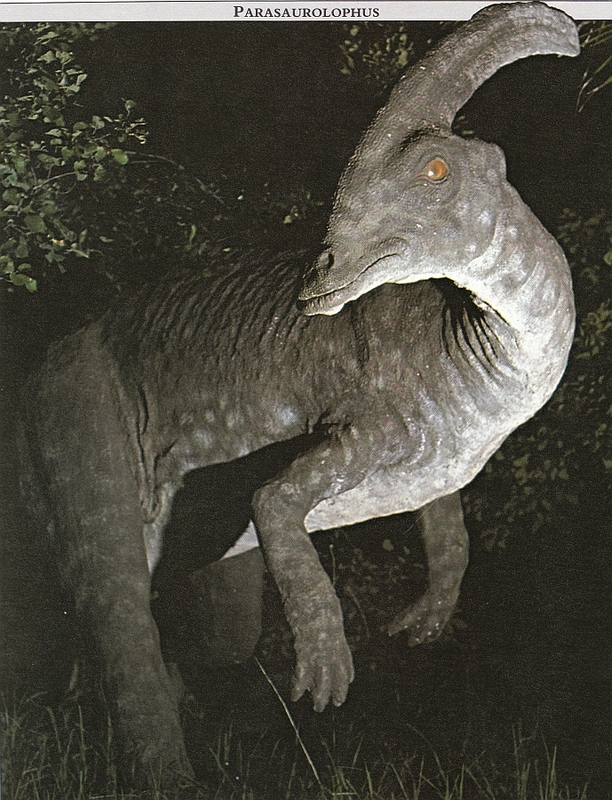 Furthermore, Halstead describes (and Caselli correspondingly illustrates) the neck muscles of this creature attaching to its frill in such a way that it essentially merged into the animal's back. Darren Naish (him again!) 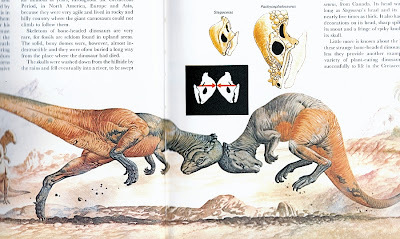 has had a look at the absurdly overmuscled ceratopsian head phenomenon, and it's well worth a read. More Neave Parker copying, in the form of the classic skulking Megalosaurus (with tiny, four-fingered hands), naturally living in, er, the Early Cretaceous. It's a legacy of a time when the name Megalosaurus was applied to every extinct theropod under the sun, of course, but this strange error probably goes all the way back to their depiction alongside Iguanodon in Victorian art (when geology was in its infancy). 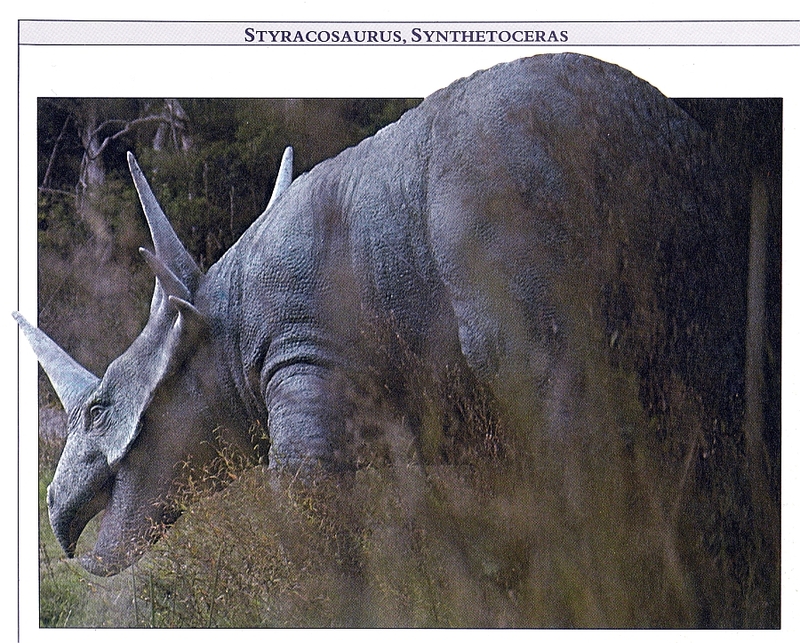 Note the very Parker-esque Polacanthus and Hypsilophodon with scutes in the background. Regardless of its scientific obsolesence, the scene is still beautifully painted, with a herd of Iguanodon lurking just out of scanner range to the right. Oh dear. I absolutely love the colours, and the feathers are beautifully rendered, but...why? WHY? You've drawn a skeleton RIGHT THERE! Look at it! Look at an extant bird's skeleton! I need a lie down. And finally...it's the image you've all been waiting for! Maybe. 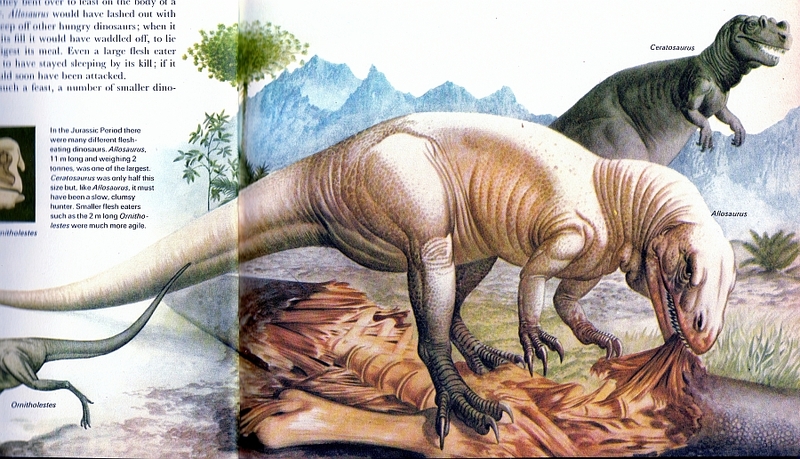 This illustration of two fighting Pachycephalosaurus is probably my favourite from the entire book. There's a fantastic sense of movement and inertia here, and that impact looks painful - just look at the one on the right, sailing through the air. There's even a brilliant Handy Diagram to show you in which direction the heads would have travelled, just in case you couldn't figure it out for yourself. Just wonderful stuff.